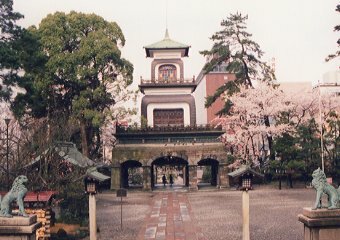 The magnificent,three-story entry gate of this shrine with its stained-grass window and layered Tomuro stone construction,is a symbol of Kanazawa city. 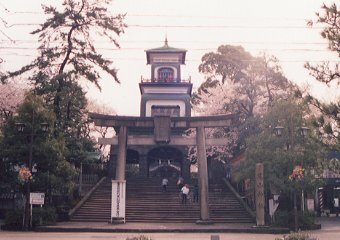 This building enshrines the feudal lord MAEDA Toshiie. 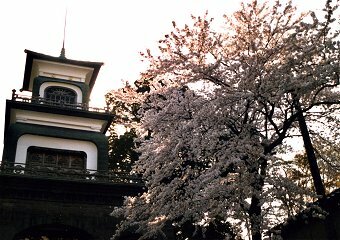 It was built in 1837 with the help of a Dutch teacher who was one of the first foreign residents in Kanazawa. The shrine originally served as a lighthouse visible from the sea. 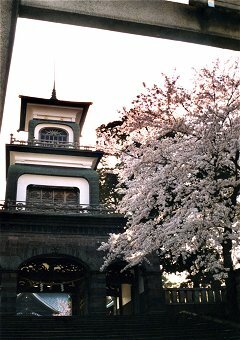 In spring,the surrounding grounds have a beautiful wisteria garden and on New Year's many people go there to pray. 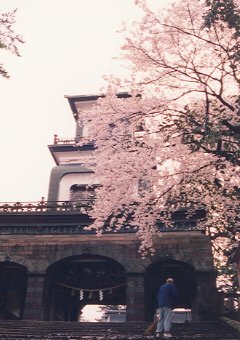 It is also a popular spot for couples to get married. 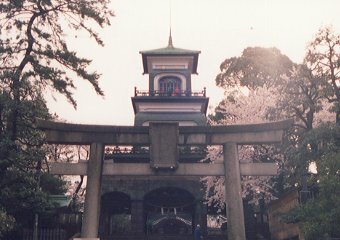 In 2003,the KENROKUEN-KIKUZAKURA(cherry blossoms) were planted near this Shin-mon(God gate).